The Passage Brady was built in 1828 and named after the merchant who financed its construction. This covered gallery today consists of two sections, as the central area was demolished in 1854 for the opening of the Boulevard de Strasbourg. It boasted an elegant rotunda that compensated for the slight deviation of its layout. The section that today links no46 rue du Faubourg St. Denis to nos22-23 Boulevard de Strasbourg has retained its glass roof. The open-air second section links the Boulevard de Strasbourg to no43 rue du Faubourg St Martin. The Brady Passage never was an elegant and trendy shopping arcade, but a second-rate covered passage lined with second-hand clothes stores, reading rooms and public baths. Customers steadily lost interest and by the beginning of the 20th century it had fallen into oblivion. 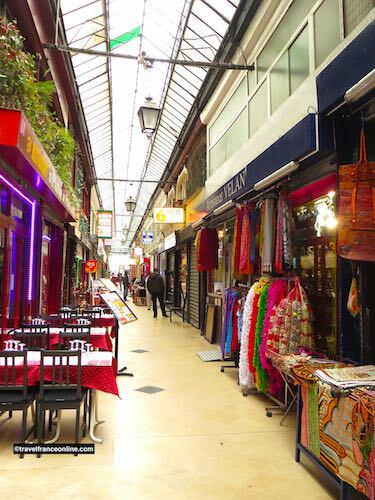 Its rebirth took place in the 1970s when low rents attracted Indian and Pakistani businesses that eventually owned it its nickname of Little India. This is where you’ll find countless restaurants from India, Pakistan, Bangladesh, Mauritius and Reunion that serve affordable and delicious traditional Oriental dishes. You’ll also find many small businesses such as hairdressers and Indian fabric shops crumbling under rolls of colourful clothes and fabric. These turn the Passage Brady into one of the most exotic passages of Paris, rich in delightful spicy aromas and colours. Its original floor mosaic, bearing its name by its entrances, is no exception to the rule: blue against a yellow background. 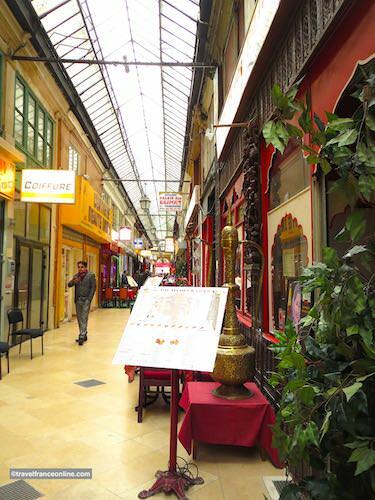 Passage Brady is a 10mn walk from the charming Passage des Panoramas, Passage Verdeau and Passage Jouffroy.